Shoji Tabuchi Show is one of the best Branson shows where you can watch a unique entertainment showcasing stunning harmonies, blazing violins, and world-class choreography. This great family show features famous fiddler and violin player Shoji Tabuchi, along with his wife, Dorothy, and daughter Christina. The show features many different musical genres that gives you the chance to hear both classical and contemporary songs. Shoji Tabuchi Show features an amazing band handpicked by Shoji from different areas of the world. With the extraordinary musical sense of Shoji, he knew exactly what he wanted in a band and he searched the world over to find the exact musicians that later became the most amazing musicians in the country. Shoji is endearing and can quickly inspires the audience with his unassuming personality. His wife, Dorothy is the director, creator, and producer of the show. She supervises the intricate choreography of the many show numbers and makes sure the show runs smoothly. She appears also in the show on select dates. Their daughter Christina is a talented vocalist and dancer and performs on the show on select dates. The show features a variety of musical numbers that include gospel, country, Cajun, big band, show tunes, classical, and fifties. It also features cultural numbers that incorporate Broadway, Mardi Gras, and a number including a tribute to the Japanese culture that includes a huge dragon, Taiko drums, and beautiful Japanese costumes. There are also many special effects that are well presented throughout the show. The Shoji Tabuchi Show’s musical performances include everything from classical to country played with skill in a palatial setting that appeals to both young and old. It is truly one of the most unique Branson shows in the Ozarks. 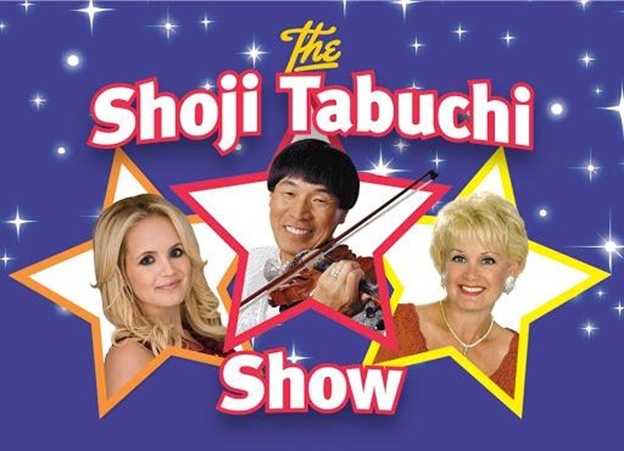 Shoji Tabuchi Show in Branson is such a great family show with extraordinary musical entertainment that every music lover raves about. The show features an astounding state-of-the-art variety of dancing and singing productions that rival the pure entertaining show of Las Vegas or New York. This fascinating family production show in Branson consists of an excellent sampling of Shoji’s world-renowned showmanship as an entertainer and fiddle mastery; gifted abilities of his wife Dorothy; and his talented daughter Christina who performs as dancer and vocalist. The extraordinary vocalists of the show uplift the musical excitement with lovely ballads, classical songs, and gospel music that give delight to the toe-tapping audiences. Once you take foot into the show, you will almost feel as if you travel back in time to the 30s. The theater is beautifully decorated with fresh blooms of flowers that are placed everywhere from the lobby to ladies room. The men’s room of the theater features a fireplace, billiard table, and leather seats. The ladies powder room is beautifully finished with onyx and granite sinks with gold faucets and fresh orchids at each sink. As one of the most exciting Branson shows, Shoji Tabuchi Show is the country’s first family musical entertainment with Shoji’s amazing performance of blazing violins and stunning harmonies.